Some bad news for the polling business. Strategic Vision (R) has a new poll in Ohio showing Bush ahead 52% to 43% there. However, there is also a Lake Snell Perry (D) poll showing the race there to be an exact tie, with both candidates at 46%. It is becoming increasingly clear that the pollsters are producing the results that the people paying the bills want to hear. Even pollsters who were once thought to be above suspicion are now suspicious. Gallup, for example, is now normalizing its samples to include 40% Republicans, even though the 2000 exit polls showed the partisan distribution to be 39% Democratic, 35% Republican. There is scant evidence that the underlying partisan distribution has changed much since then. Other pollsters also normalize their data, but most don't say how. Normalizing the sample to ensure the proper number of women, elderly voters, etc. is legitimate provided that the pollster publicly states what has been done. Despite a smattering a polls today, none of these mean much on the eve of the first debate. For many people, the debates will determine their votes. Former President Jimmy Carter, who has monitored elections in dozens of countries around the world, has stated that the election arrangements in Florida do not meet basic international requirements for a fair and honest election. Add four hurricanes to the controversy raging about purging from the rolls people with the same name as a convicted felon and other irregularities and you get a big problem. Senate News: A new poll in Colorado puts Peter Coors ahead of Ken Salazar by 51% to 46%. On the other hand, another poll in Louisiana puts the three Democratic candidates at 47% vs. the one Republican candidate with 44%. If no one gets 50% on Nov. 2, there will be a runoff in Dec. Brad Carson has opened a 5% lead against Tom Coburn in Oklahome. Tom Daschle also has a 5% lead against John Thune in South Dakota. All in all, the current projection for the Senate is 50 Republicans and 50 Democrats (counting Sen. Jeffords as a Democrat). 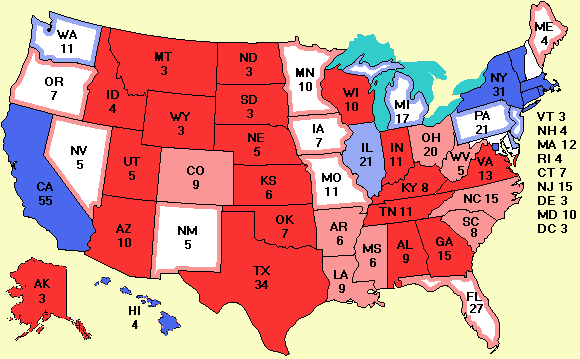 If Ken Salazar wins against Pete Coors, a likely event given all polls except today's, the Democrats will take back the Senate 51 to 49. Since I am answering many fewer mails these days (400 came in yesterday) I thought I would answer some of the common questions on the website. but PLEASE !!! read the welcome page and the FAQ. Most questions are answered there already. I am not including Nader in FL much because Rasmussen has a poll of Florida every day and he doesn't include Nader. If newer poll is available that does include Nader, I will use that.